The clinical research footprint is shifting overseas. There are a number of factors, including cost savings and shorter timelines, driving this shift and making it cheaper and easier to conduct trials outside the U.S. Ethical and scientific concerns may arise when conducting studies in other countries. 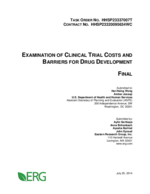 Conducting trials at multiple sites across different countries magnifies the barriers associated with multicenter trials.